Available as an ASAP in The Journal of Physical Chemistry A. As a general rule in computational chemistry, the smaller the molecule, the harder it is to get right. As a brief summary, parabanic acid has several interesting properties of significance to computational chemists as both a model for other systems containing similar sub-structures and as a complicated little molecule in its own right. 1. The solid-state spectrum requires solid-state modeling. This should be of no surprise (see the figure below for the difference in solid-state (top) and isolated-molecule (bottom)). This task was undertaken with both DMol3 and Crystal06, with DMol3 calculations responsible for the majority of the analysis of this system (as has always been the case in the neutron studies reported on this site). 2. The agreement in the hydrogen-bonded N-H…O vibrations is, starting from the crystal structure, in poor agreement with experiment. You’ll note the region between 750 and 900 cm-1 is a little too high (and for clarification, the simulated spectrum is in red below). According to the kitchen sink that Matt threw at the structure, the problem is not the same anharmonicity one would acknowledge by Dr. Walnut’s “catalytic handwaving” approach to spectrum assignment (Dr. Walnut does not engage in this behavior, rather endeavors to find it in others where it should not be). 3. The local geometry of the hydrogen-bonding network in this molecular solid leads to notable changes in parabanic acid structure that, in turn, leads to the different behavior of the N-H…O vibrational motions. There is one potentially inflammatory comment in the Conclusions section that results from this identification. The parabanic acid molecule is, at its sub-structure, a set of three constrained peptide linkages that under go subtle but vibrationally-observable changes to their geometry because of crystal packing and intermolecular hydrogen bond formation. This means that the isolated molecule and solid-state forms are different and that peptide groups are influenced by neighboring interactions. So, why should one care? Suppose one is parameterizing a biomolecular force field (CHARMM, AMBER, GROMOS, etc.) using bond lengths, bond angles, etc., for the amino acid geometry and vibrational data for some aspect of the force constant analysis. The structural data for these force fields often originates with solid-state studies (diffraction results). This means, to those very concerned with structural accuracy, that a geometry we know to be influenced by solid-state interactions is being used as the basis for molecular dynamics calculations that will NOT be used in their solid-state forms. Coupled with the different spectral properties due to intermolecular interactions, the description being used as the basis for the biomolecular force field likely being used in solution (solvent box approaches) is based on data in a phase where the structure and dynamics are altered from their less conformationally-restricted counterpart (in this case, solid-state). A subtle point, but that’s where applied theoreticians do some of their best work. Abstract: The incoherent inelastic neutron scattering spectrum of parabanic acid was measured and simulated using solid-state density functional theory (DFT). This molecule was previously the subject of low-temperature X-ray and neutron diffraction studies. 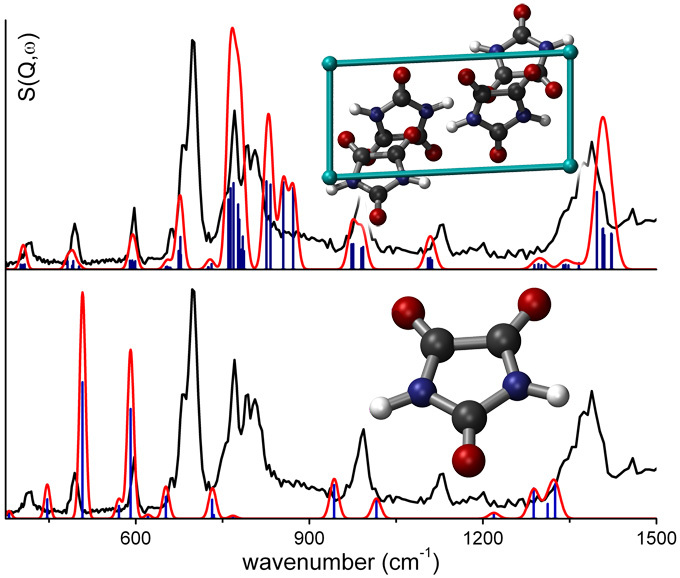 While the simulated spectra from several density functionals account for relative intensities and factor group splitting regardless of functional choice, the hydrogen-bending vibrational energies for the out-of-plane modes are poorly described by all methods. The disagreement between calculated and observed out-of-plane hydrogen bending mode energies is examined along with geometry optimization differences of bond lengths, bond angles, and hydrogen-bonding interactions for different functionals. Neutron diffraction suggests nearly symmetric hydrogen atom positions in the crystalline solid for both heavy-atom and N-H bond distances but different hydrogen-bonding angles. The spectroscopic results suggest a signiï¬cant factor group splitting for the out-of-plane bending motions associated with the hydrogen atoms (N-H) for both the symmetric and asymmetric bending modes, as is also supported by DFT simulations. The differences between the quality of the crystallographic and spectroscopic simulations by isolated-molecule DFT, cluster-based DFT (that account for only the hydrogen-bonding interactions around a single molecule), and solid-state DFT are considered in detail, with parabanic acid serving as an excellent case study due to its small size and the availability of high-quality structure data. These calculations show that hydrogen bonding results in a change in the bond distances and bond angles of parabanic acid from the free molecule values.